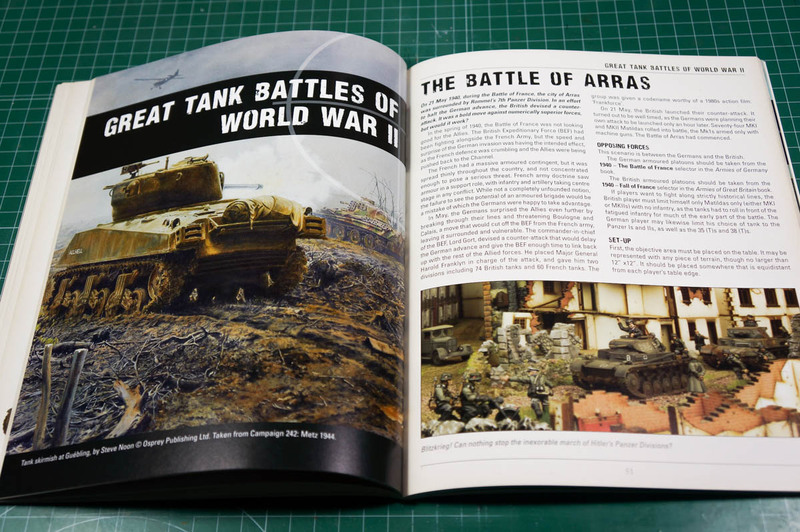 Warlord Games published some months ago the first expansion for Bolt Action: Tank War. After some battles, we’re now able to discuss it, contents, new rules, etc. As other Bolt Action books, for less than 20€/$25 you have a softback 96 page full color book. 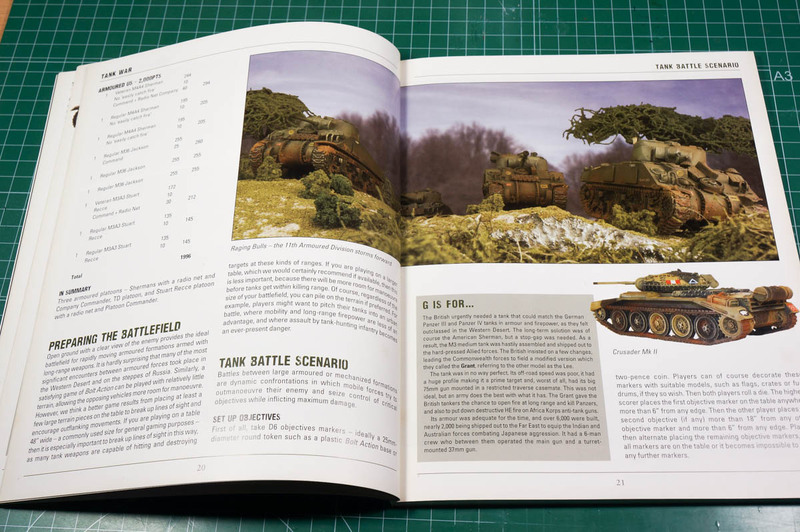 Tank War introduces the use of many tanks in one Platoon Selector, far away from the ‘1 tank’ per list in the standard platoons selectors from the rulebook and the army books. 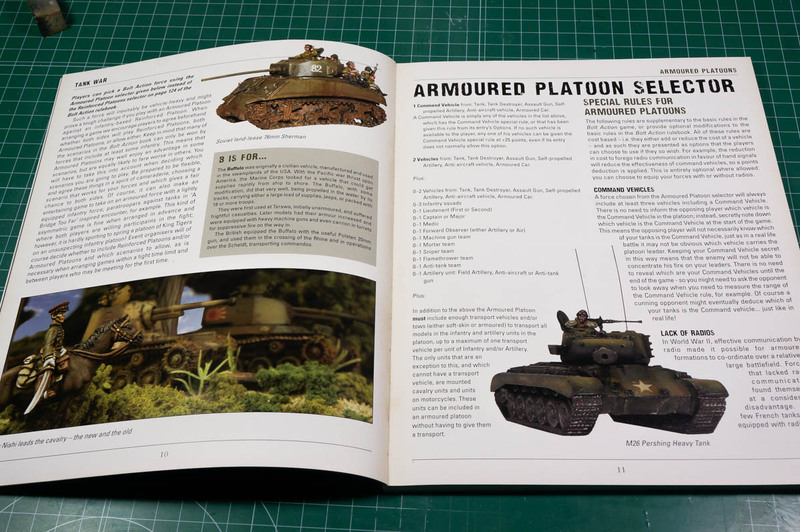 It describes the new type of platoon selector, 3 new special rules (Command Vehicles, Lack of Radios and Radio Networks) and real tank platoons formations in WW2. As we’re not going to play with those formations (more than 15 tanks), this is more a curiosity than useful information. The new platoon selector (Armoured Platoon Selector) forces us to choose 1 Command Vehicle as the HQ and 2 more vehicles. Those could be Tanks, Tank Destroyers, Assault Guns, Self-propelled Artilleries, AA Vehicles or Armoured Cars. So, our list will have, at least, 3 vehicles. The optional units include 2 more slots for vehicles (for a total of 5), and the usual infantry units. The Infantry Squads on the Armoured Platoon are limited to only 3 of them. Also, this part of the book overrides the rule in the rulebook for pinning vehicles: now, not every heavy weapon will pin a Veteran Vehicle, only those who are powerful enough to damage them (after applying the PEN modifiers). The Inexperienced Vehicles will be pinned as usual, with every impact they receive of any heavy weapon. The Regular Vehicles will roll a die to see if they’re treated as Veteran or Inexperienced for this shot. I think it’s a great rule change, as many people uses HMG’s to pin vehicles, even if they cannot hurt them. No more for experienced vehicles. The new scenario is easily explained: 1d6 objectives that the players place alternatively more than 6″ from any table edge. The objectives can be captured and recaptured many times, but only objectives captured in the final turn count towards victory points. The game can last 7 or 8 turns, depending on the dice roll after the 7th turn. So, nothing really new or bright idea here. The thing is, each time one of your vehicles destroys another vehicle or survives a battle (20 XP), it gains experience points (XP points equal the points of the destroyed vehicle divided by 10 or 20 XP for surviving a battle). Driver: Quick Reflexes. You may make an escape move when this vehicle is attacked. Gunner: Hair Trigger. After the vehicle makes a Run order, it may fire it’s main gun. Commander: Strict Discipline. The vehicle loses all of its pins. If you want to use the Vehicle Crew Experience rules, the book says the vehicles should start as Inexperienced and their quality will improve once they reach a number of skills (2/3 skills, Regular, and more than 4, Veteran). We’ve tried starting with Regular and Veteran Vehicles and the game flows perfectly. Also, we’ve designed some cards to use the skills, instead of rolling dice and writing them down on paper, you draw a card from the deck, and when you use a skill, you only need burn the skill card. Easier than pen/paper and much more graphical! We’ll upload those cards for anyone who wants to play with them in next posts. Many special characters, based on famous exceptional tankers, like Kurt Knispel, Wittman, Carius, Abrams, etc. There are characters for US Forces, Britain, Germany, Sovit Union and France. 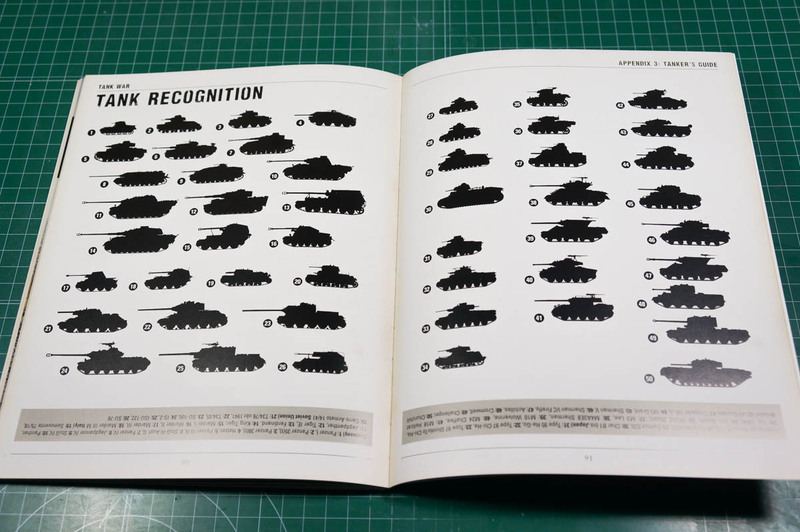 Also, the tankers have rules for the tanks they rode, with special rules and costs in points. For example, Ernst Barkmann’s Panther costs 496 points, and Kolobanov KV-1 costs 465 points. 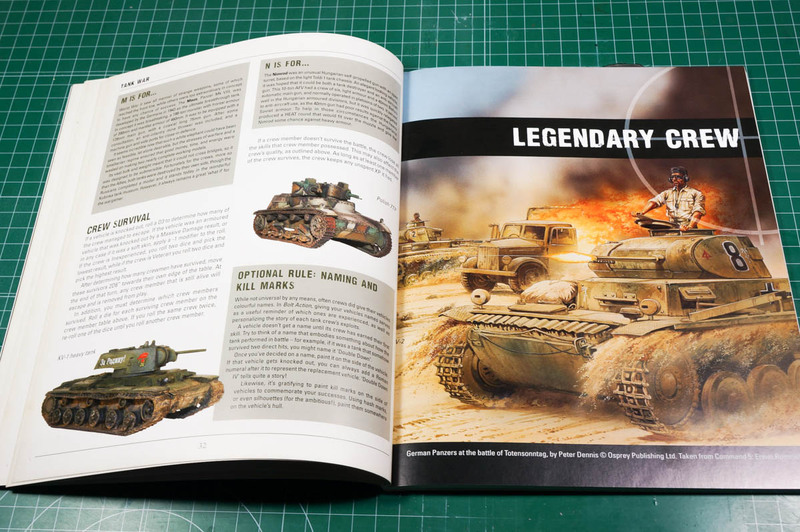 Recreate some of the most famous armoured battles of World War 2, with unique rules, how to set them up, victory conditions and special rules, like Dust Storm, Minefield, Dense Smoke, Honour Bound, Revenge and Dawn Assault. The battles include: Battle of Arras, Operation Supercharge, Kursk: Battle of Prokhorovka, Hell’s Highway, Battle of Bastogne, Battle of Imphal, Battle of Berlin and Battle of Khalkin Gol. In this part they’ve added some special vehicles, like the Bergepanther or the Cromwell ARV. Not so many interest here, but well, more options are always welcome. 21 vehicles in total. Completely wasted pages. It contains soldier slang used in World War 2 by tankers. At least there are only 4 pages. 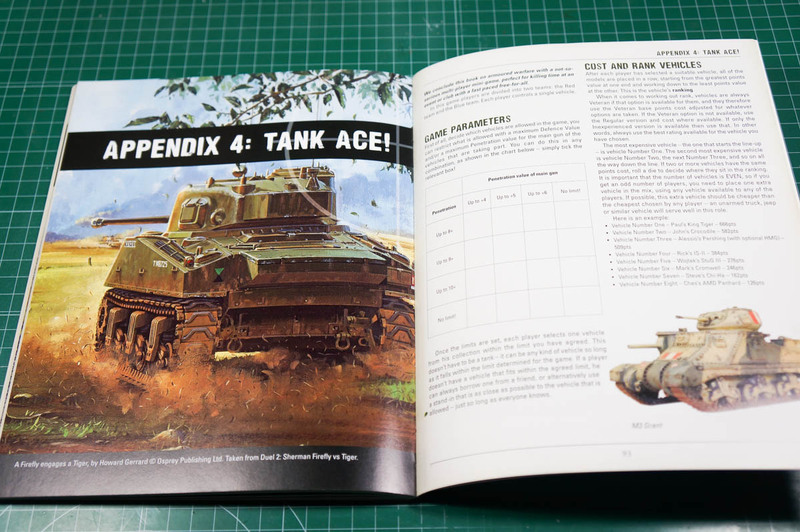 The last 4 pages of the book presents a little game for multiplayer battles with two teams (red and blue). Each player controls one tank only, and if there is an odd number of tanks, the player with the cheapest vehicle control the extra vehicle. So, it’s a kind of arcade type game. We’ve not played this game yet, but we’ve played one upgraded version, including respawn and the vehicle crew experience rules. And it was really nice! What a super-useful review: thank you! Certainly helped my decision making! How’d you go with those experience cards?